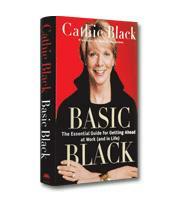 Balancing the ledger of her life in Basic Black, Cathie Black, once president and publisher of USA Today, now president of Hearst Magazines, spells out life and business lessons in crisp black and red –– literally. Throughout the book, Black candidly and comfortably shares stories of her own personal successes and failures during her career, as well as the stories of friends and colleagues from decades spent in the publishing industry. Not everyone could have convinced Oprah Winfrey to launch her own magazine –– but Cathie Black did. Balancing the ledger of her life in Basic Black: The Essential Guide for Getting Ahead at Work (and in Life) Black, once president and publisher of USA Today, now president of Hearst Magazines, spells out life and business lessons in crisp black and red –– literally. In a solid effort to engage the reader, Black includes “Black & White” sections that offer practical tips, whereas her case studies are printed completely in red, making them stand out easily from the rest of the chapter. Throughout the book, Black candidly and comfortably shares stories of her own personal successes and failures during her career, as well as the stories of friends and colleagues from decades spent in the publishing industry. In an effort to show how far she’s come in her career (or possibly to make readers feel better about some of their own career gaffes), Black relates a story from her first job out of college: a sales assistant for Holiday magazine in New York City. Thrilled with the great start to her career, Black soon found herself looking for the next career move, so much so that she made copies of her resume in order to be ready at a moment’s notice for the next big thing. Unfortunately, she forgot to remove her original from the copier and ended up with a phone call from one of the magazine’s senior executives and got her first bit of career advice: “Next time you’re duplicating your resume … remember to take the original off the copier.” Not everyone gets off the hook that easily. For many of Black’s readers, much of her book will be more like a statement of the obvious and less like the sage advice one would hope to find. For instance, she relates many of the lessons learned in nearly a decade working for Al Neuharth at USA Today such as the classic “Don’t take no for an answer” and “Find a way to get it done. No excuses!” These so-called lessons are nothing new and groundbreaking. Nonetheless, what makes the book memorable is Black’s inside look at the inner workings of the publishing world, as well as the quick glances at fascinating business and media personalities such as Rupert Murdoch and Bonnie Fuller. Basic Blackmay not offer a plethora of sage advice to the seasoned career woman, but that doesn’t stop it from being an engaging read, and possibly a great book to pass on to our younger generation. Black offers a basic guide for getting ahead, but the greater offering is really her collection of intriguing stories, which in the end, convince us that Cathie Black - despite the awe-inspiring resume - is human like the rest of us.